You’ve Built it, now it’s time to paint it! WarbirdColors primers and paints are water-based polyurethane coatings formulated specifically for model aircraft builders. Utilizing state-of-the-art spectrometer analysis, WarbirdColors paints have been matched to the documented military colors utilized by the world’s air forces from WWI to the current day. 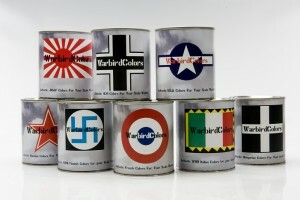 Our RLM colors for the Luftwaffe, for example, were matched from the color chips provided in the Monogram Publication “The Official Monogram Painting Guide to German Aircraft 1935-1945”, while our USA camouflage colors were match from an official set of metal plates, circa 1943 as well as documented Federal Standard colors. WarbirdColors now provides builders a safe, simple to use, authentic color match for their scale warbird.